With the memories of the Old Year still fresh on our minds, and the hope of yet another New Year before us, many of us enter into that old peculiar ritual of making New Year’s Resolutions. I joked with someone at work on New Year’s Eve saying, “New Year’s resolutions are for non-perfect people, which explains why I do not make any of them.” But seriously, I think we all make resolutions of sorts, and we don’t necessarily wait for a New Year to do so. 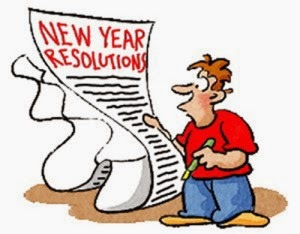 Despite our good intentions, however, it is sad that many resolutions do not last out the week. Having said that, have you ever wondered why we even bother making them at all? I believe that ultimately we make New Year’s resolutions because something in our lives is not as we would like it to be. We make them because we have taken a personal inventory and found ourselves lacking. Spiritually, we might make them because of some sort of revelation or inspiration. Others may not see the mess we see ourselves in, but we see it, and that’s what matters. There is weight to be lost, a bad habit to quit, and perhaps even a good habit to develop. In the words of Thomas ‘A Kempis, “Habit overcomes habit.” The way I see it, such is the nature of the New Year’s resolution. While I haven’t officially made any resolutions this year, I kind of would like to see a few changes in my life develop as well. Like many of us, I could stand to lose a pound or two … or thirty. I would like to blog more, and focus on making those posts a little more edifying in nature. On a more personal “note” (pun intended), I would like to learn to play the guitar again, and maybe even a saxophone. Ultimately, I’d like to discover that fine line between making a living and making a life. Hmm, maybe I have made some resolutions as well. However, spiritually speaking is where you’ll probably find my biggest resolutions. If I were to ask you to summarize 1 Corinthians 13 into one sentence or phrase, what would you come up with? I asked myself that question a while back and came up with this: “Love trumps all doctrine.” Perhaps a great New Year’s resolution for everyone who calls themselves a Christian would be to go through the exercise of carefully re-reading that chapter and see if we don’t each come up with something similar. Does love really trump all doctrine? If so, how will that affect our plans and relationships in this New Year? My New Year’s resolution is going to include striving to learn how to move the “love” that I profess to have from the theoretical to the practical. How will I do that? I hope it will include being less judgmental of other Christians who think and worship differently than I do. As someone has so eloquently said, “Pointing out the weeds in your neighbor’s garden, doesn’t remove them from your own.” As I reflected on that, it sort of reminded me of Jesus’ saying in Matthew 7:3, “Why do you look at the speck of sawdust in your brother’s eye and pay no attention to the plank in your own eye?” I find myself no longer interested in the “specks” in the eyes of others, but I am deeply concerned with the “plank” in my own. I hope that my love will also become practical by committing myself this year to regularly volunteering some time at some inner city ministry that could use a helping hand, regardless of their denominational or religious affiliation. Now there’s a resolution that I really would like to see become a reality; a New Year’s resolution that’s less about me, and more about others. Someone once said that “actions speak louder than words,” and I believe that is true. However, lately I’ve been hearing “words” pretty loudly too from within some Christian circles, and unfortunately they do not always sound very loving or gracious. Please understand, I am preaching to myself here as much as to the next one; for every finger I’m pointing out towards another, I have three pointed back at me. My New Year’s resolution this year includes lining up my walk with my talk. I remember in the early days after I left the pastoral ministry and the institutional church, several people told me that I sounded angry a lot. I don’t know why, and that’s not even important, but this came out verbally as well as through some early blog posts. Then along came an illumination from the Apostle Paul who said, “Let your conversation be always full of grace” (Colossians 4:6). I noticed that he said “always,” as opposed to only “some of the time,” or “as the mood strikes us.” Is there still some measure of anger in our conversations today? Is my conversation “always” full of grace? I am sorry, but I know that mine is not, and this grieves me terribly. I have heard some people sometimes try and justify an angry spirit based upon the fact that they found some mention in the Scriptures of where Jesus and Paul also got angry. While that is true, it does not logically follow that I then also have the same right to be angry with my brothers or sisters. It is one thing to occasionally snap and blow a fuse in anger; it is quite another to regularly be angry. At the very least, if there is anger, it needs to be Spirit-led, loving, gracious, and redemptive in nature. When I leave any of those out of the “justified-anger” equation, anger itself is no longer justified, and it is no longer in keeping with the theme of 1 Corinthians 13. My New Year’s resolution seeks to lose any remaining anger issues and seek a conversation that is always full of grace. By now most of us probably know where we each stand when it comes to the institutional church versus the non-institutional church, and all those other little idiosyncrasies of other Christian traditions and those who teach them and those who embrace them. Some we agree with, while others we strongly disagree with. My challenge for myself this New Year is to strive to move beyond all discussions that only serve to highlight our differences as opposed to those things that we have in common. As Paul said, “So whatever you believe about these things keep between yourself and God” (Romans 14:22). While in context it has to do with dietary regulations, I keep hearing that verse in my head over and over again. Could it be God speaking to me about this? I am convinced that it is. Unfortunately, I haven’t always been listening very well. Likewise, I’m tired of all the “us and them” feuding, between the “good guys and the bad guys,” as it were; tired of Christians and pseudo-Christians, and of who falls into which category. Am I the only one who finds it strange that everybody is so sure that they’ve cornered the truth market? Really? Think about it. How is it that six Christians from ten different denominations can have fourteen interpretations of the same verse of Scripture? Yes, I am being a little facetious, but you get the point. I’m the only one who has got the truth market cornered? Really? I think we all still have a lot to learn about Christ’s plan for His church and understanding a proper hermeneutics pertaining to it. My goal for this New Year is to hopefully come to a little closer understanding of what that plan might be. So, Yes, I guess I have made some New Year’s resolutions too. I recognize that you, my brother, might see some of these things I little differently, but I’m OK with that, and I hope that you are too. Can we focus on what we have in common and fellowship around that? I pray that it may be so. Peace, Blessings, and Happy New Year.